Another job on the ship. “Carpenter” is not a job that we associate with pirates. Building things just doesn’t seem like a very piratical activity. But pirates in the Golden Age sailed on wooden ship, and the job of Carpenter was one of the most important in the crew. Without repairs, even a wooden ship will sink. The main job of the ship’s Carpenter was to care for the hull of the ship. Even in peaceful times, the hull of a wooden ship was under constant attack from barnacles, rot, and a nasty sort of burrowing clam known as a ship-worm. Ships also took damage from running over coral or rock formations. 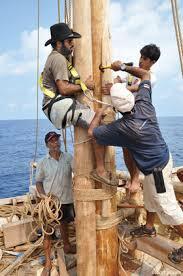 Masts sometimes broke under the strain of wind pressure, or failed because of tropical rot. Accidents damaged the decks, stairs, railing and furnishings of the ship. In a perfect world, the ship would carry a spare for every useful item on board. But in the real world such a wide variety of equipment would eat into valuable cargo space. So ships did the next best thing – they carried a wide supply of unworked wood, and one or more skilled Carpenters to turn it into whatever was needed. 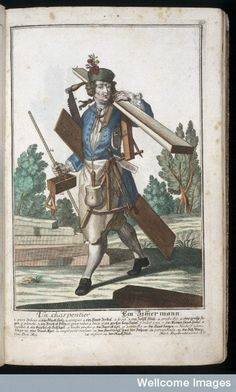 Carpentry equipment during the Golden Age was tried and true. Many of the designs of tools and equipment went back to the middle ages. It was primitive, but all worked, and with it a trained man could make anything from a deck to a mast to a new arm for the ship’s figurehead. The first tool of an 18th century Carpenter was his work bench. This was a sturdy block of wood, about six feet long and about 18 inches wide. It had 4 strong legs on each end, making it unlikely to tilt of wobble. But unlike modern work-benches, it was chair-height instead of table-height. The reason was simple. The screw vise that we use today to steady a piece of wood we ae working on was not yet a common tool. 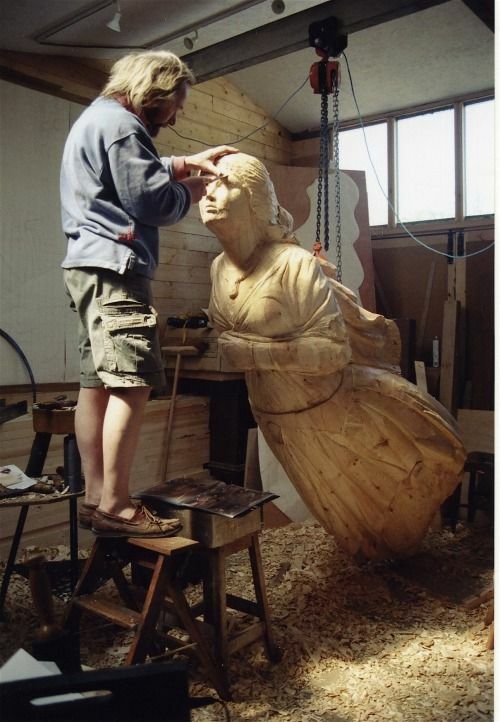 To keep a piece of wood steady, the carpenter placed it on the bench and then simply sat on it. This worked quite well for most applications. The Carpenter would sit, and then saw, drill, or chisel the wood to the desired shape. Drills existed, but not in a form we would easily recognize. For small applications, the Carpenter might use a bow drill. The drill head was set on the end of a long shaft. The shaft was run through a loop in the string of a bow, and as the bow was moved back and forth, the bit would turn. For larger applications, one might use a Brace and Bit. This was a primitive sort of crank (the brace) with a removable drill bit. The Carpenter placed the bit where he wanted to drill, then turned the crank by hand. Though slow, this was a perfectly adequate way to drill wood. My own father owned a brace-and-bit set, which he used during the 1930’s and 40’s at job sites where no electricity was available. 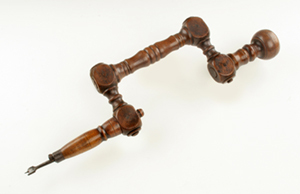 An 18the century hammer and saw look very much like the modern equivalent, but both were designed so they could be repaired – the saw by replacing its blade, the hammer by replacing its wooden handle. Back in the day, you didn’t throw away a whole tool just because part of it was broken. Chisels were nearly exactly the same as those today. Few modern-day Carpenters own an adze, but for the 18th century wood worker it was essential. This tool looks something like an ax, but the blade is horizontal rather than vertical. 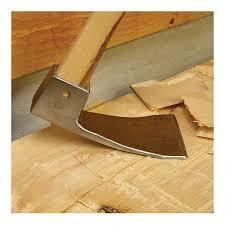 The adze can be used to cut grooves in wood, or to smooth a beam for use, or even to cut planks from a felled tree. It can take the place of an ax, and was used as a plane, the modern plane not having been invented yet. With these simple tools, a good Carpenter could make nearly anything, using only the roughest pf materials. But his most important work lay in simply keeping the ship afloat. All wooden boats leak to some extent. Water will come right through wood, given enough time. Furthermore, the normal flexing and moving of a ship at sea loosens all the ship’s joints over time. Water comes in at the seams. Day by day, the carpenter maintained these joints. Often this meant driving fibers such as frayed rope between boards that had too much space between them. The fibers would then swell and block the gaps. The Carpenter would finish it off with a coating of tar, to complete the waterproof seal. Small holes were plugged by driving in a wooden wedge or cone. Once the device was in place, it swelled from exposure to water, and completed the seal. Excess wood could be cut away. 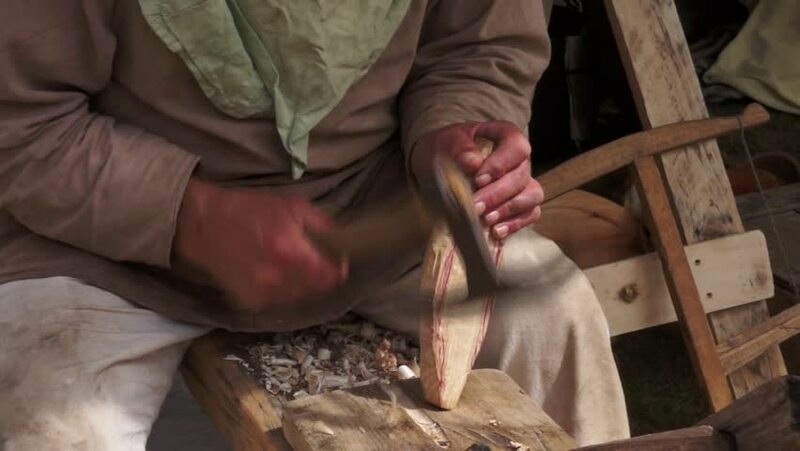 Making these wedges and cones was also work for the Carpenter and his apprentices. Larger leaks or damage from cannon fire could be “shored up” by placing a slab of wood against the hole on the inside and bracing it with a log or beam placed at a 45-degree angle and wedged between the plug and the deck blow. This was difficult, dangerous work. Even as the Carpenter and his mates worked, the water rose around them, and the sea fought them every inch of the way. Cracked masts would be splinted, in much the same way a broken bone is splinted. 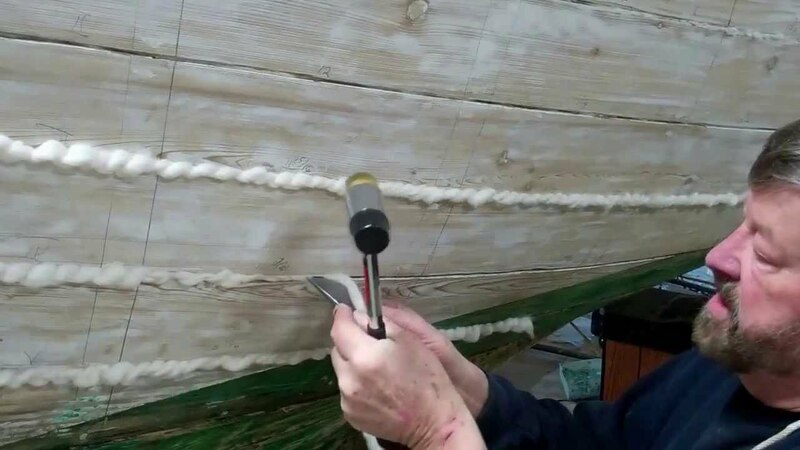 This might involve a cooperative effort by the Carpenter and Bosun, as the proper pieces of wood needed to be selected and shaped, then hauled into place and bound to the mast with ropes. If a whole mast was carried away, something needed to be rigged up to replace it, if the ship was to move at all. A pirate ship might cut down a tree, but if trees were in short supply, anything might do. Many ships have limped back into port with makeshift masts constructed out of anything available. The point was to get to shore before the ship sank, or ran out of food or water. Because he was so vital, a merchant ship’s Carpenter commanded a high rate of pay, and was usually treated with respect by his captain. Because of this, pirate captains faced a shortage of skilled carpenters. Even Sam Bellamy, one of the richest and most persuasive pirates was forced to kidnap Carpenters in order to modify and maintain his ships. Carpenters Thomas South and Thomas Davis, who survived the sinking of Bellamy’s flagship, had been conscripted by Bellamy. Therefore, while six of their fellow pirates were found guilty and hanged, they were acquitted of all charges and spared the gallows. Which is one way to be a pirate and have a real life, too.